Acura and Marvel Entertainment, LLC announced today the details of their promotional campaign for the blockbuster film THOR. In the luxury automaker’s first partnership with a major motion picture, Acura will have a pivotal role in THOR as the official vehicle of S.H.I.E.L.D. S.H.I.E.L.D., the fictional worldwide peace-keeping organization of the Marvel Comics Universe, has a leading role in this film portrayal of the iconic comic-book series. Throughout THOR, S.H.I.E.L.D. agents drive various Acura vehicles, including the MDX, ZDX, RL and TL models. THOR, directed by Kenneth Branagh, from a screenplay by Ashley Edward Miller, Zack Stentz and Don Payne and a story by J. Michael Straczynski and Mark Protosevich, will be released by Paramount Pictures on May 6, 2011. 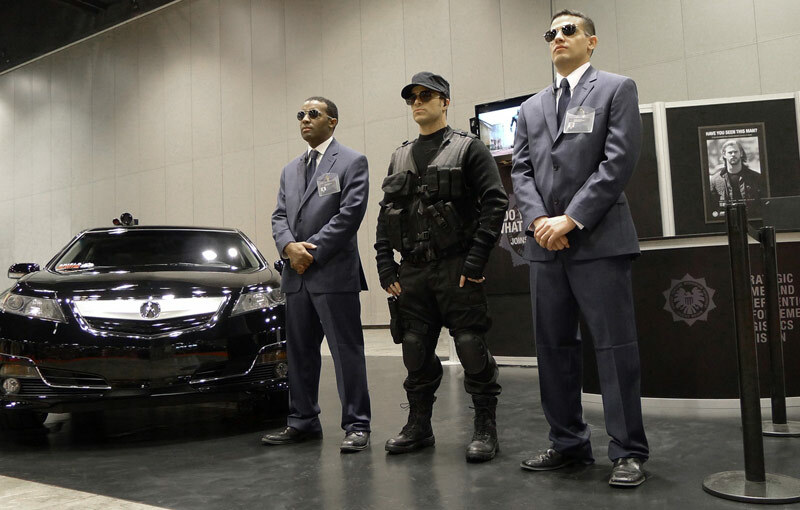 Acura kicked off its partnership with Marvel on March 14, 2011, at C2E2, Chicago’s Comic & Entertainment Expo, with S.H.I.E.L.D. recruitment booths where recruits were able to take a picture and receive a S.H.I.E.L.D. ID badge. The booths will be on display this week at the New York Auto Show and Pier 83, including a S.H.I.E.L.D.-embellished Acura TL at both locations. Acura’s interactive website for THOR, http://www.joinshield.com/, will serve as the hub of the national advertising campaign and will allow fans to immerse themselves in the world of THOR as actual S.H.I.E.L.D. agents. Users can receive their official ID badge, post it on Facebook and climb the ranks within the organization by completing assigned case files to earn the chance to win rewards like movie tickets, iPad® 2 tablet computers, LiveScribe “smart pens” or the grand prize of an exclusive evasive-driving experience. Fans can also build their own virtual S.H.I.E.L.D. vehicle with over-the-top features to aid in their online adventure. Social media will be leveraged throughout the campaign to recruit THOR fans to join S.H.I.E.L.D. The Acura Facebook page will also feature THOR content, including videos co-produced with Marvel. The advertising campaign, developed by Acura’s agency of record, rp&, a division of RPA, is composed of a multiplatform media buy, retail tie-ins and national ABC screenings of THOR with after-parties in select markets. The newly refined 2012 Acura TL will be featured throughout the campaign, including a 30-second TV spot which incorporates the new vehicle with scenes from THOR. The spot will run on network sports and spot TV, as well as across 18 cable networks such as ESPN, Adult Swim and Comedy Central. Acura will release unique S.H.I.E.L.D.-themed video and content across several websites to drive traffic to http://www.joinshield.com/ and recruit users to join S.H.I.E.L.D. The “recruitment” theme will be seen on Marvel’s website, http://marvel.com/, Fandango’s THOR page and Facebook advertising, but also in unexpected places such as LinkedIn. Acura offers a full line of technologically advanced performance luxury vehicles through a network of 270 dealers within the United States. The Acura lineup features six distinctive models including the RL luxury performance sedan, the TL performance luxury sedan, the TSX Sport Wagon and sedan, the turbocharged RDX luxury crossover SUV, the MDX luxury sport utility vehicle and the ZDX four-door sports coupe. rp& is a full-service marketing communications division of RPA, headquartered in Santa Monica, Calif. Established in 2008, rp& has been responsible for the development of all Acura National, Regional, Online, Direct Mail and Event Marketing communications. For more information, visit http://www.rpa.com. its stuff like this that baffles me. No wonder Acura gets little respect as a top tier lux brand or near-lux brand. How deep is the affluent comic book crowd? Fire the designers and the marketing department!!! !